History has a huge bearing on the mind of the readers. It's not only about wars but also about some timeless love moments which leave many enchanted. 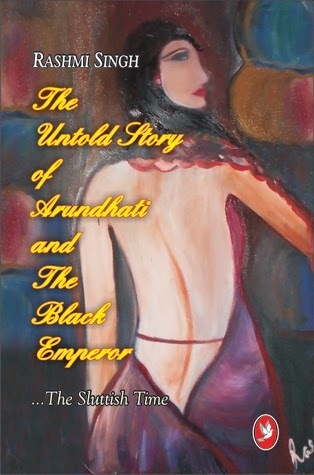 Author Rashmi Singh in her book "The Untold Story of Arundhati and the Black Emperor" traverses a journey which has some elements of it's own. Will it create a stir in the mind of the curious readers? Let's find out. This is the story of sluttish play of time which loves to stay with rich, famous and powerful and deserts the weak and poor! A magical, mystical, passionate and sinful love story which played havoc with history-a story which was buried in the banks of Krishna River or somewhere amongst the mountainous valley of the Vindhyas in 7th century A.D. This tale is intricately woven around Chalukya Parameshwara or The Black Emperor, Pulkasein II, (610A.D-643A.D.) of Western Chalukya dynasty, his untamed passion for wars and his unusual desire for the forgotten enigmatic beauty, Arundhati! The story also traverses the immortal love life of Pulkasein II’s contemporary, Narsimhavarman I of Pallava dynasty and his beloved Sivagami. First look at the title and the cover and some wild guesses can be made about the story line. The cover image not a pleasant one. A lavish representation of the theme and genre was required. The title a long one but making headway in to the mind of the readers. The story is of Chalukyan and Pallava dynasty and their popular kings Pulakesin II and Narsimhavarman I respectively. Their conquests, wars, animosity, diplomacy, supremacy, the quest to rule south and a factor which later on paves way in to the life of both at different junctures but makes or breaks their lives i.e love. The story is also of Arundhati one of the most beautiful woman in those eras and her heart yearning for Pulakesin II and her dreams of becoming the queen. Also it's about Sivagami the beloved of Narsimhavarman I but both the woman leading contrasting lives and suffering at the hands of their fate. So what will happen to both the dynasties? Will the cunning Pulakesin II rule the south or Narsimhavarman will decimate and establish his prowess? Who will gain and who will lose in this war of love, ruthlessness and emotions? That's what the story is all about. There are a lot of questions about history and there are not many answers. This book answers few of them and has intricately wove a charm around the readers with it's uncanny story line. The historical fiction turns out to be a love story and a hate story too in equal fervour. The essence never lost in the tussle. The majestic descriptions and the contrasting personalities of the two kings and their kingdoms adding glory to the story. The emotions present in the right mix and making the heart yearn for more. The book with it's back and forth pull makes the story line more complex but interesting. The downside of the story are some characters which have been sidelined after getting space in the story. The editing blemishes leak their way through out the narration. The end not grand enough to create the same ripple effect as one would expect. Some incidents pretty abrupt and giving blues to the readers in an already complex narration. All in all the both history and love join hands to tell a tale so vivid and heartless that even readers can't fathom it's intensity. It touches the heart and at the same time creates hatred in the mind too. It hits at the right spots and then leave an impression of its own. The book with it's audacity and loud story telling makes it a worthwhile effort. It lacks some fine touches but gives enough for the readers to relish and cherish. I liked the book to a great extent basically due to the author's exceptional courage to take a risk with a genre and part of the history people may or may not connect with and also because it is a perfect blend of emotions. The sad part however, is that the book has still not been picked up by a lot of book critics on the scene and I wonder why. This book deserves a read.Also, for everyone who has been cribbing about the monotony in the industry should pick this one. Yup true Harshita most people just shrug off history as they find it boring. It certainly deserved a read and thanks for recommending it. :)..